Our family is looking forward to another mild winter. 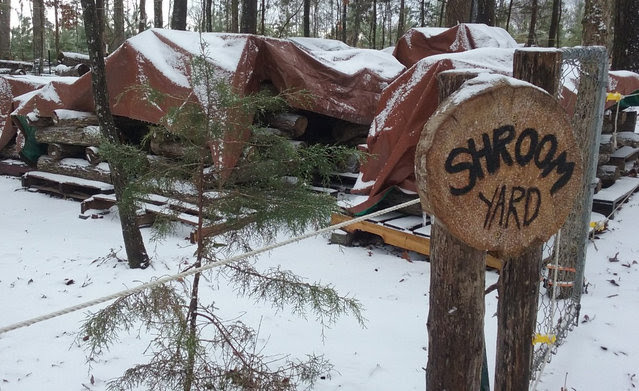 Last January our mushroom laying yard was kissed by the glistening snow. We wish you and your family a blessed new year! This time of the year our Snow Cap mushrooms are fruiting. 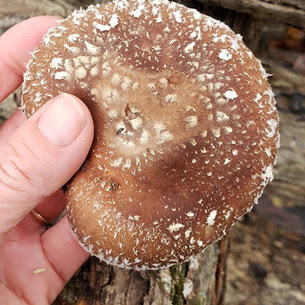 This is a cold strain of Shiitake mushrooms that prefer temperatures between 40-55 degrees. The flavor is still meaty with a dense texture. For recipes go to our website’s recipe page by clicking here. 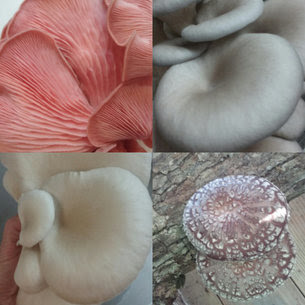 Above are some mushrooms grown at our farm. Each prefer a specific food source, fruit at certain temperatures, need fresh air and high humidity. Below, Kira Oysters grow on Poplar logs and is a cold strain. 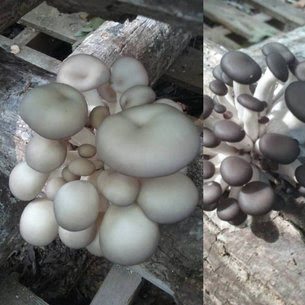 In a matter of days they progress from small dark blue pins to mushrooms ready to eat! Follow our farm journey on our FB page.